After the mist and murk of our Boxing Day walk we were considerably heartened by the blue skies of the following day which welcomed us back to Swanage. We set off east to Peveril Point where the coastline swung back south again. There were good views back to The Pinnacles here, the chalk stacks created from collapsed sea arches which lay to the north of us. These were the first signs that we were going to be getting a geology lesson today, but of course the entire 95-mile Jurassic Coast is one big geology lesson. Deb and I exchanged nervous glances – our kids were on school holidays. Lessons of any kind were taboo. Peveril Point cuts back south into Durlston Bay, a bay of just over three-quarters of a mile in length. 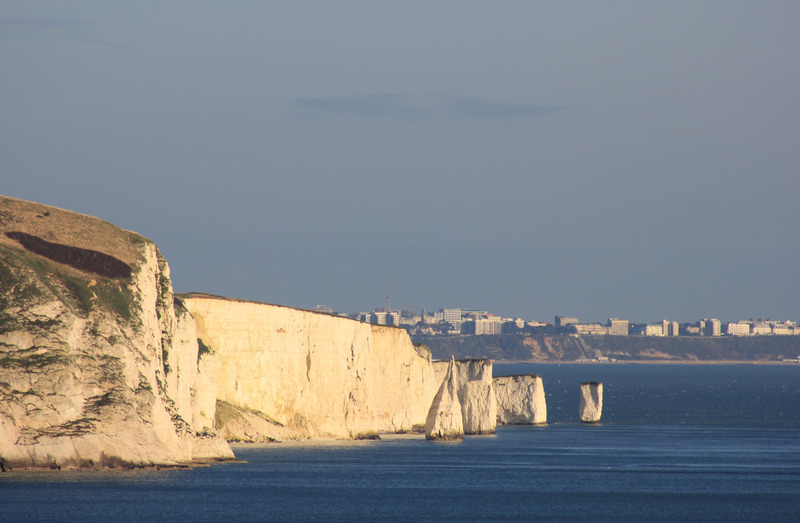 Compared to Swanage Bay, which sits to its north, Durlston Bay is smaller. This is because it is made of harder rock. In the distance the chalk stacks of The Pinnacles can be seen, running between Handfast Point to the north and Ballard Point to the south. This chalk section was formed millions of years ago by the tiny exoskeletons of millions upon billions of plankton. The chalk band ends at Ballard Point, which in the photo is where the cliffs suddenly cut inland. This is Swanage Bay. 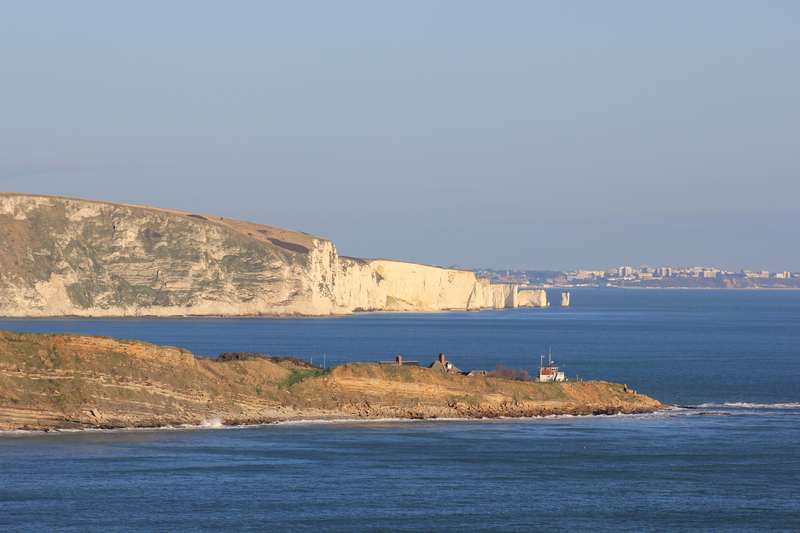 Swanage Bay is formed rock known as the Wealden Group, formed out of sands and clays. It is softer than the chalk which is why the coastline here has eroded back into what is today Swanage Bay. At the southern end of Swanage Bay the Wealden Group gives way to the Purbeck Group, a limestone which, like the chalk, is harder than the Wealden Group. Peveril Point, which can be seen in the foreground of the photo, consists of this Purbeck limestone. 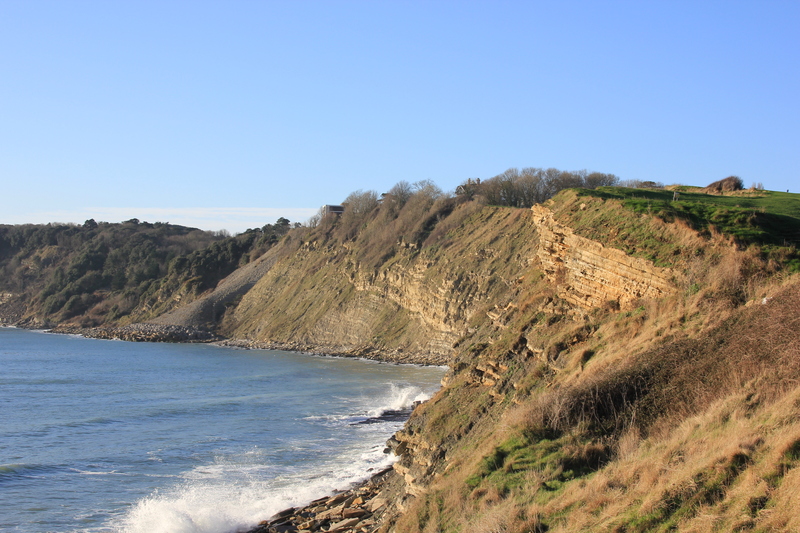 The softer rock of Swanage Bay has been eroded back, but the limestone of Peveril Point is harder, less affected by sea erosion and so has formed a headland, like the chalk to the north. Of course, Durlston Bay itself is also formed of the same limestone. It is not immune to erosion, but looking at any map will illustrate that Durlston Bay is smaller and more shallow than Swanage Bay, due to the fact that its rock composition is more resistant to erosion. In the photograph, as Peveril Point recedes into Durlston Bay, rock strata can be seen sloping down into the sea from west to east. Here they are again, this time taken from Peveril Point itself and looking west along Durlston Bay. These strata were originally horizontal, but were tilted upwards approximately 35 million years ago, during a geologic mountain building episode, when the Alps were formed. The Jurassic Coast tilts east, with the younger chalk rocks lying at its eastern end at Handfast Point. At the other end of the Jurassic coast, 95 miles west, older rocks which originally lay underneath the younger rocks have been lifted upwards and now lie exposed. It is the enormous variety of visible rock, formed over millions of years and now lying exposed for all to see, which makes the Jurassic coast so uniquely interesting. Our geology lesson wasn’t just going to be for today – it was going to last 95 miles. We definitely weren’t going to tell our children. This entry was posted in Dorset and tagged coast, Dorset, Durlston, erosion, geology, Jurassic Coast, Swanage, travel, walking. Bookmark the permalink. Nice post, and sounds like a great little geological walk! Thanks for the comment; it was absolutely fascinating.